Sanaa Lathan won the heart of movie lovers in 2000 with her epic performance as a young athlete in Love & Basketball for which she received much critical acclaim. Prior to that, she earned an honorary degree for her performance in Wesley Snipes’ 1998 film Blade. The talented actress has gone on to feature in numerous notable roles on the small screen and the big screen. She has also received a few nods for her stage performances – Lathan is definitely, in all respects, a fantastic performer. Some are of the opinion that Sanaa Lathan is underrated, however, she has had her share of the box-office hits. In 1999 she featured in the romantic comedy The Best Man, one of the highest-grossing black movie. The talented actress reprised her role in the 2013 sequel to the movie and has equally landed major roles in other big-budget productions. One thing is certain, Sanaa Lathan has established her place as a household name in Hollywood. The gorgeous actress was born Sanaa McCoy Lathan on September 19, 1971, in New York City. Her mother, Eleanor McCoy, was a dancer and actress while her father Stan Lathan was a TV producer and director. Her parents got divorced while she was still young. This saw her shuttling between Los Angeles and New York to spend time with each of them. Sanaa Lathan had her high school education at New York’s Manhattan Center for Science and Mathematics. Her college education was at the University of California, Berkeley where she earned a bachelor’s degree in English. She went further to obtain a master’s degree in drama from Yale University. She began her acting career in New York by performing in off-broadway productions. She eventually moved to Los Angeles, performed on the LA stage for a while before earning herself TV roles in Family Matters (1989), NYPD Blue (1993), In the House (1995) and Moesha (1996). Sanaa Lathan recorded her movie debut on the action film Drive (1997) followed by scintillating performances in Blade (1998), The Wood (1999) and The Best Man (1999). In 2001, Lathan received an NAACP Image Award and a BET Award for her role in the romantic drama Love & Basketball (2000). Even after achieving so much success on-screen, Sanaa remained loyal to the theatre which has equally earned her much critical acclaim. The talented actress received a Tony Award nomination in 2003 for her performance in the Broadway revival of A Raisin in the Sun. She equally reprised her role alongside Sean Diddy Combs in the 2008 made-for-television production of the play. In 2004, the actress played the lead role in Alien vs. Predator followed by other notable roles in Something New (2006), The Best Man Holiday (2013) among several others. The multitalented actress also lent her voice to the role of Donna Tubbs in the animated sitcom The Cleveland Show (2009-2013). She received the 2016 NAACP Image Award for Outstanding Actress in a Motion Picture for her role in The Perfect Guy. Lathan is currently in her 40s, however, she has maintained the charming looks that has endeared her to audiences over the years. Sanaa Lathan is a beautiful, talented and highly successful actress. No doubt dozens of men would do anything just to be with her. However, the Perfect Guy star is yet to find her real-life perfect man. According to her, the idea of being married and going through life’s journey with someone special is a great one. However, having worked hard to achieve certain milestones in her life, she still has so many things to be grateful for even if that special union hasn’t happened for her. Therefore, Sanaa Lathan is currently not married. However, there are widespread speculations that the actress was previously married to Hollywood actor Shemar Moore. According to the reports, the duo got married on May 11, 1990, and the marriage ended in a divorce in 1996. However, there are no photos or any tangible evidence to support these claims. It remains unclear if Sanaa Lathan is currently in a relationship. The actress has always been one to guard her private life closely. Be that as it may, one thing is certain, she has never been in lack of dating options. She is not a newcomer to Hollywood and over the years, the media has kept an account of the different people she has been involved with. One of Sanaa Lathan’s high-profile relationships was with her Love & Basketball costar Omar Epps. Their on-screen romance on the 2000 film translated into a real-life relationship. Fans of the duo who had witnessed their on-screen chemistry desperately hoped that the two would tie the knot, it never happened. Other famous actors that Sanaa Lathan has been linked to include Wesley Snipes, her Out of Time (2003) costar Denzel Washington and Tyrese Gibson. She has also been linked with NFL quarterback Colin Kaepernick. In 2010, the actress was rumoured to have been engaged to American music mogul and Loud Records founder Steve Rifkind. 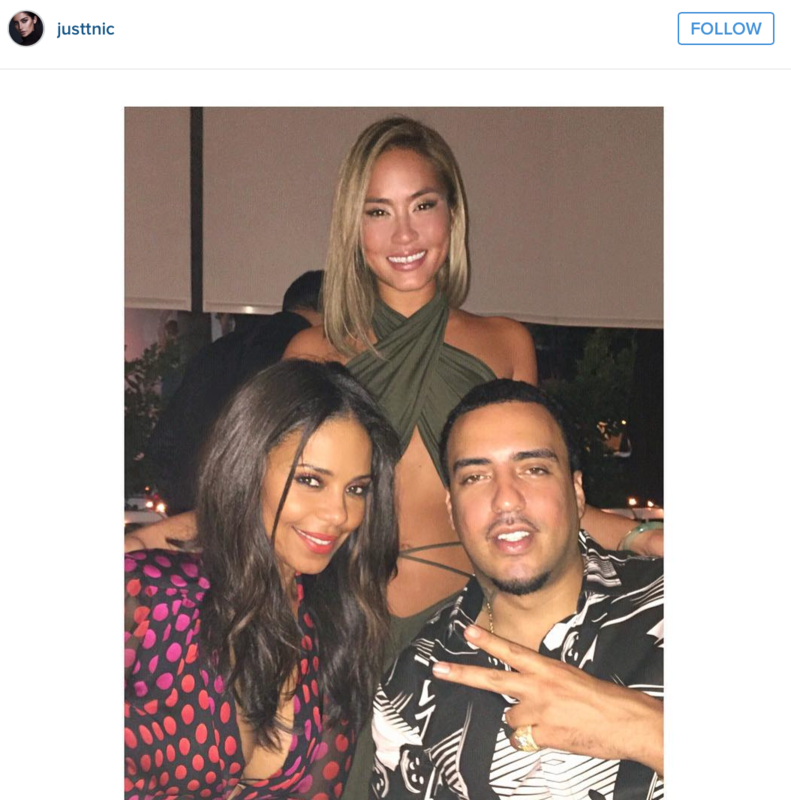 In 2015, the actress was again rumoured to be in a relationship with Moroccan-American hip-hop artist French Montana. The rumours were fuelled by several videos and pictures of the duo spending time together. Sanaa didn’t make any efforts to quell the rumours but she never confirmed it either. Having kids and starting a family may be in the future plans of the Perfect Guy star, however, that has not come to fruition just yet. Fans who would love to see the actress procreate would have to wait a little longer as that is yet to happen. As it stands, Sanaa Lathan has no children yet. However, she fell victim to a pregnancy hoax in 2015. Being the type of celeb who doesn’t reveal much about her private life, the media are always trying to guess every move she makes thereby reaching their own conclusions. It happened that a photo of the actress cradling her belly surfaced in the media and that was all the rumour mongers needed to conclude that Sanaa Lathan was expecting a child. It was speculated that the father of the child was French Montana, being the last celebrity boyfriend of Lathan at that time. The actress took to social media to shut down the rumour mill. Sanaa Lathan has put in several decades into her acting career and has featured in numerous TV shows, movies and stage productions. It is expected that one who has dedicated her talents and life to her craft as a performer would have a reasonable amount of wealth to show for it. Sanaa obviously does not disappoint in this aspect. The actress currently has a net worth of $4 million. Seeing that the screen diva has no plans of slowing down in the near future, this amount is even expected to get much higher.